North Region Health Net Federal Services, Inc. 1-877-TRICARE This slide shows the three TRICARE regions in the United States. As you may know, we are in the _______ Region. The regional contractors listed here are responsible for customer service in each TRICARE region. Your regional contractor is _________. TRICARE South Region—includes Alabama, Arkansas, Florida, Georgia, Louisiana, Mississippi, Oklahoma, South Carolina, Tennessee (excluding the Ft. Campbell area), and Texas (excluding the El Paso area). TRICARE North Region—includes Connecticut, Delaware, the District of Columbia, Iowa (Rock Island Arsenal area), Maine, Maryland, Massachusetts, New Hampshire, New Jersey, New York, Pennsylvania, Rhode Island, Vermont, Virginia, North Carolina, Illinois, Indiana, Kentucky, Michigan, Missouri (St. Louis area), Ohio, Tennessee (Ft. Campbell area), and Wisconsin. 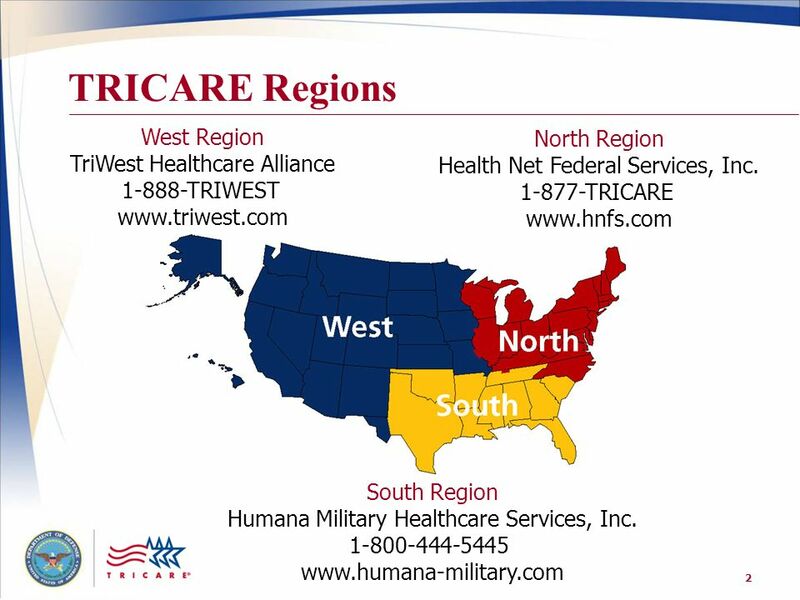 TRICARE West Region—includes Alaska, Arizona, California, Colorado, Hawaii, Idaho, Iowa (excluding Rock Island Arsenal), Kansas, Minnesota, Missouri (except the St. Louis area), Montana, Nebraska, Nevada, New Mexico, North Dakota, Oregon, South Dakota, Texas (the southwestern corner including El Paso), Utah, Washington, and Wyoming. South Region Humana Military Healthcare Services, Inc.
TRICARE beneficiaries who: Are entitled to Medicare Part A (hospitalization) Based on attaining age 65, disability or end-stage renal disease (ESRD) Must have Medicare Part B coverage (for outpatient care, such as doctor visits) to remain eligible for TRICARE Exception: Active duty service members, active duty family members, beneficiaries who have purchased TRICARE Reserve Select or TRICARE Retired Reserve, and those enrolled in the US Family Health Plan TRICARE beneficiaries who are entitled to Medicare Part A (hospitalization) based on attaining age 65, disability or end-stage renal disease (ESRD) must have Medicare Part B coverage, for outpatient care, to remain eligible for TRICARE. Exception: Active duty service members, active duty family members, beneficiaries who have purchased TRICARE Reserve Select or TRICARE Retired Reserve, and those enrolled in the US Family Health Plan. Individuals not eligible for premium-free Medicare Part A are not required to have Medicare Part B. 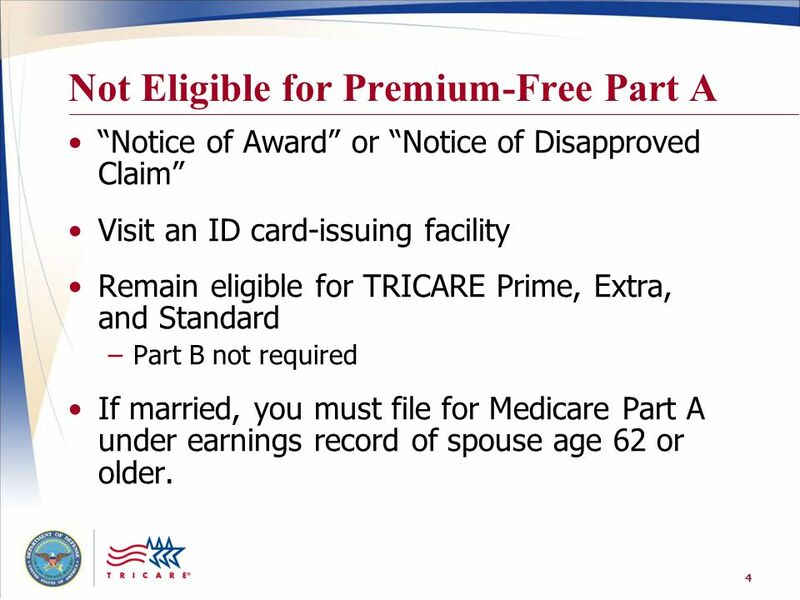 “Notice of Award” or “Notice of Disapproved Claim” Visit an ID card-issuing facility Remain eligible for TRICARE Prime, Extra, and Standard Part B not required If married, you must file for Medicare Part A under earnings record of spouse age 62 or older. If you sign up for Medicare and are not eligible for premium-free Part A under your or your spouse’s (including divorced or deceased spouse’s) Social Security number (SSN), you receive a “Notice of Award” or “Notice of Disapproved Claim” from the Social Security Administration (SSA). 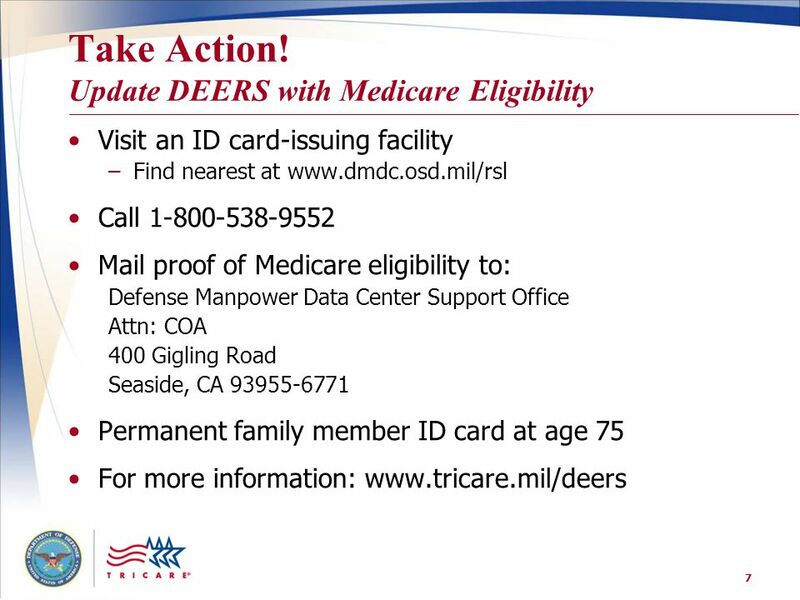 To keep your TRICARE coverage, take the “Notice of Award” or “Notice of Disapproved Claim” to a uniformed services identification (ID) card-issuing facility to have your DEERS record updated and receive a new ID card. 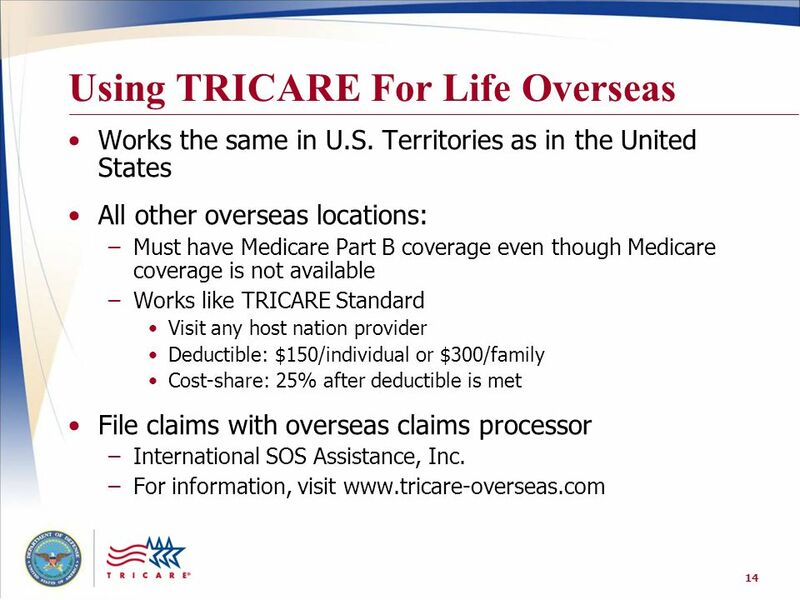 This allows you to keep your eligibility for TRICARE Prime or TRICARE Standard and TRICARE Extra after you turn 65. 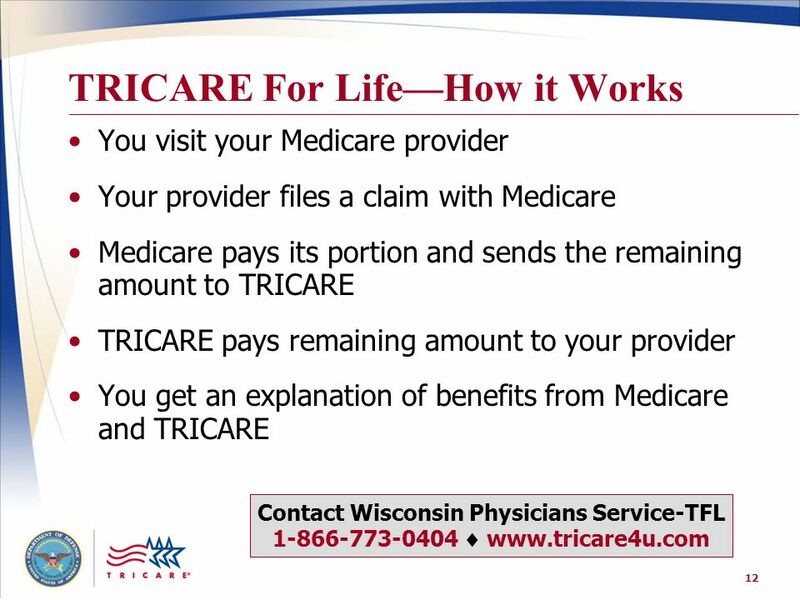 To ensure that your TRICARE coverage continues without a break, contact Wisconsin Physicians Service (WPS/TFL) after you update your DEERS record. If you are not eligible for premium-free Medicare Part A under your own SSN when you turn 65, you must file for benefits under your spouse’s (including divorced or deceased spouse’s) SSN if he or she is 62 or older. If your spouse (or divorced spouse) is not yet 62, you must file for benefits under his or her SSN when he or she turns 62. If you will be eligible under your spouse’s SSN in the future, you should sign up for Medicare Part B during your initial premium enrollment period to avoid paying monthly Part B surcharges for late enrollment. 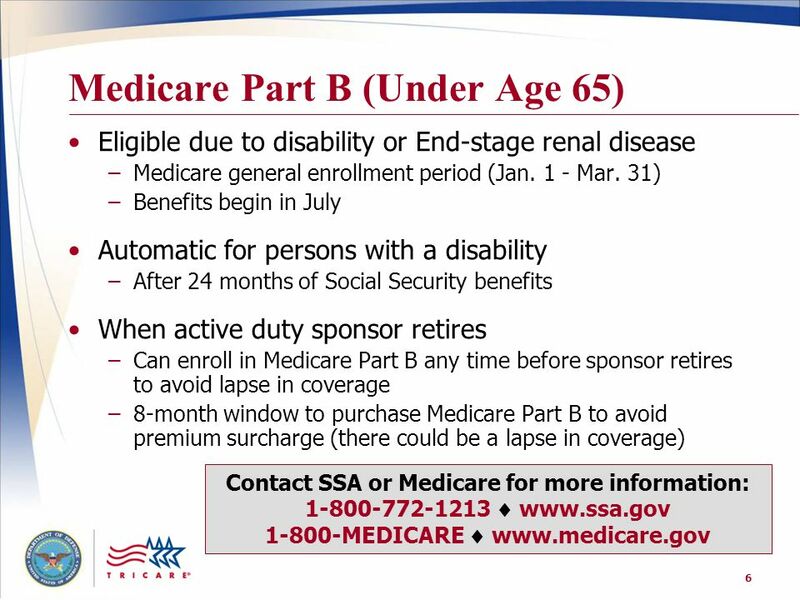 Even if you are not eligible for premium-free Medicare Part A, you are eligible for Part B at age 65. 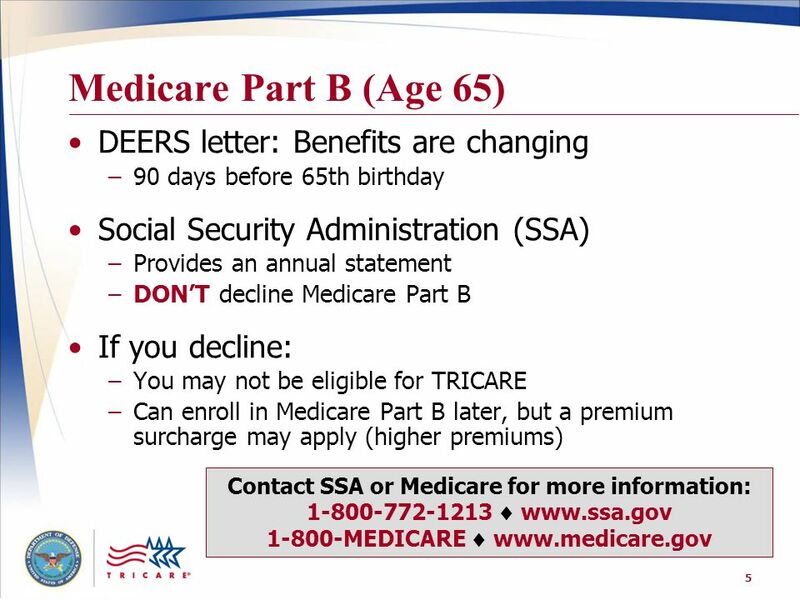 See “Medicare Entitlement Based on Age” in this section for more information. 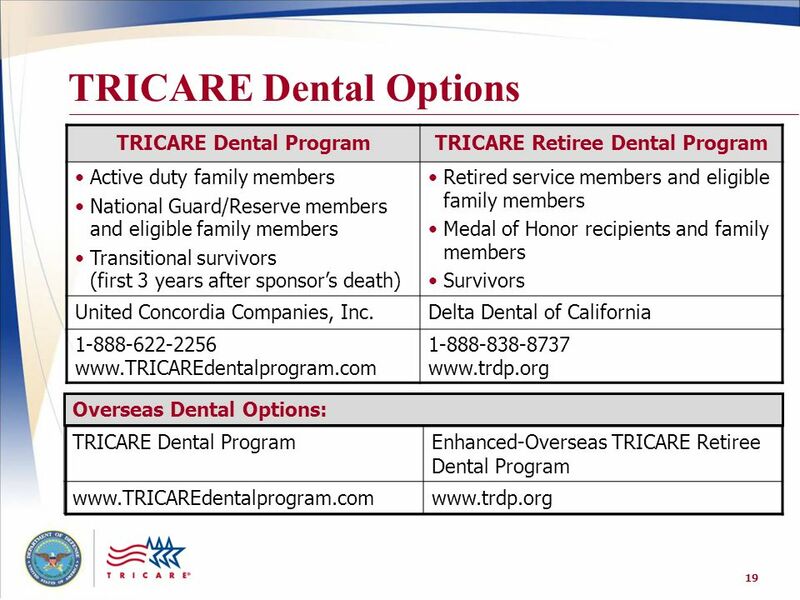 TRICARE Prime Under age 65 Age 65 and over, but not eligible for premium-free Part A TRICARE For Life TRICARE Plus TRICARE Pharmacy Options TRICARE Dental Options Uniformed Services Family Health Plan We’ll discuss each of the programs in more detail. 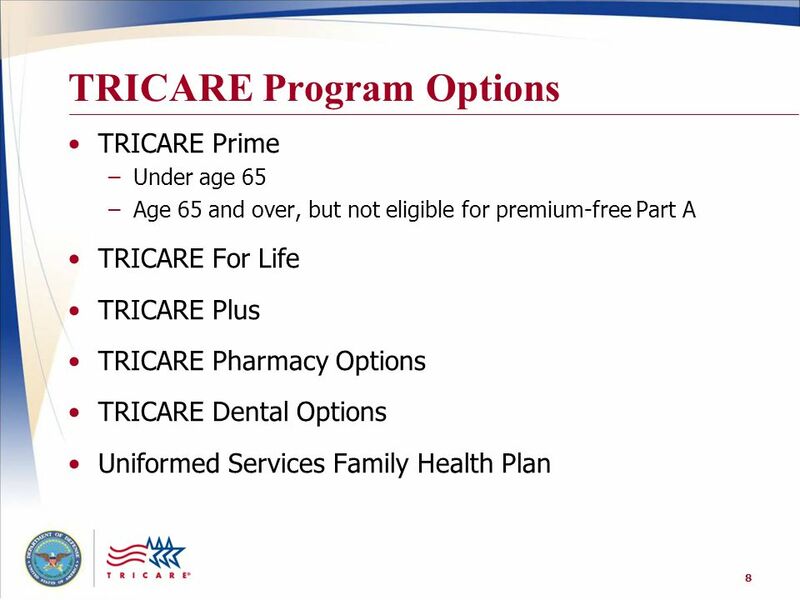 Please note that TRICARE Prime is available only to beneficiaries under age 65 or to those beneficiaries age 65 and over who do not qualify for premium-free Medicare Part A.
Medicare Card Shows your eligibility for Parts A & B and the effective dates of coverage. 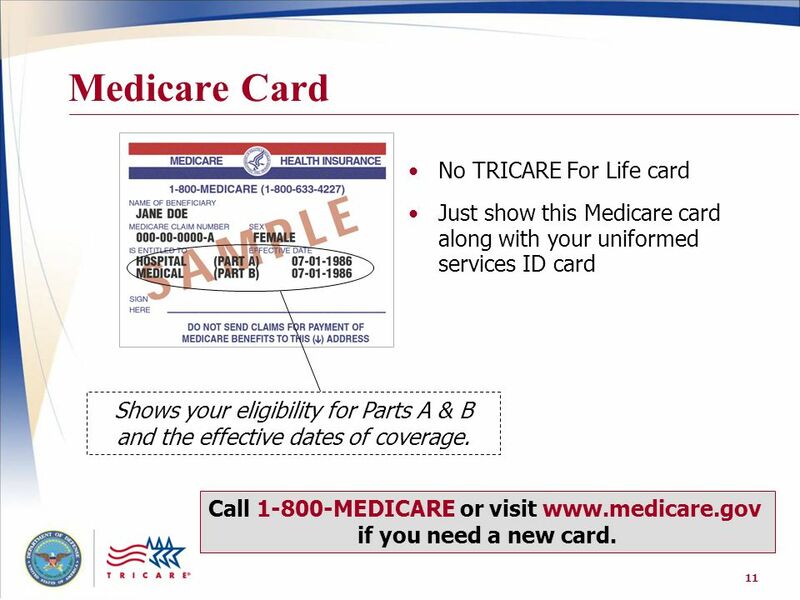 No TRICARE For Life card Just show this Medicare card along with your uniformed services ID card There is not a “TRICARE For Life” card. All you need to get care is a Medicare card along with your uniformed services ID card. Here’s a sample of what your Medicare card will look like. If you don’t have this or need another one, contact Medicare for assistance. Call MEDICARE or visit if you need a new card. Order of payment depends on whether or not you have employer-sponsored health insurance. Other Health Insurance (not based on current employment) With Employer-Sponsored Health Insurance (based on current employment) 1st Payer: Medicare 2nd Payer: OHI or Medicare supplement 3rd Payer: TRICARE 1st Payer: Employer- sponsored plan 2nd Payer: Medicare 3rd Payer: TRICARE OHI is any non-TRICARE health insurance that is not considered a supplement. This insurance is acquired through an employer, entitlement program (including Medicare), or other source. 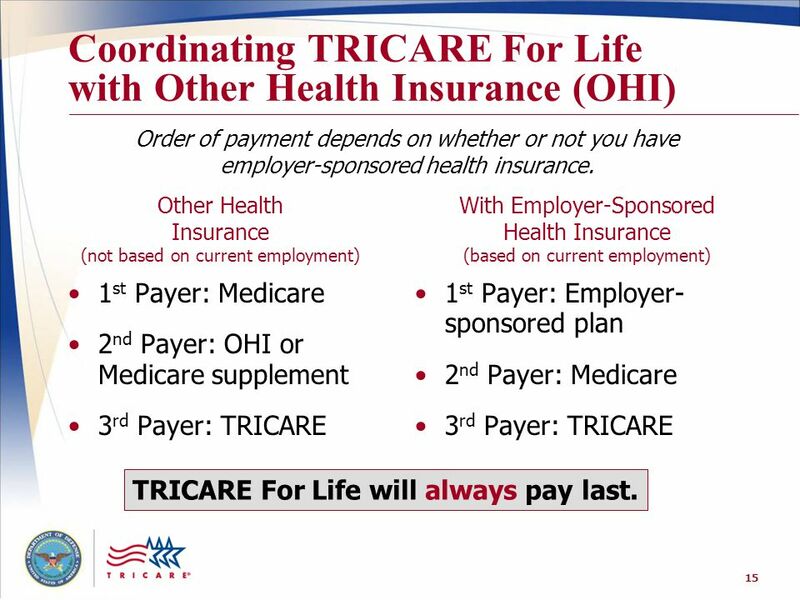 TRICARE is the last payer to all health benefits and insurance plans, except for Medicaid, TRICARE supplements, the Indian Health Service, and other programs or plans as identified by the TRICARE Management Activity. If you have other health insurance which is not based on your current employment or that of a family member, for example a private Medicare supplement, Medicare is the primary payer, the OHI is secondary and TRICARE will become the third payer. In this situation, after Medicare pays its portion of the claim, Medicare forwards the claim to the other health insurer for processing and payment. If there is any remaining balance, you (the beneficiary) will need to file a paper claim with WPS and must include the EOB from Medicare and the OHI. Submit paper claims to: WPS-TRICARE For Life P.O. 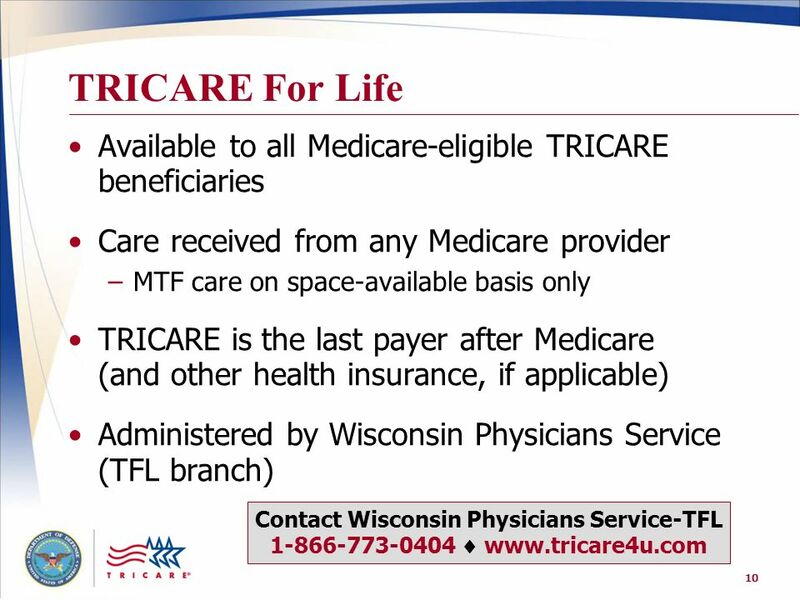 Box 7890 Madison, WI TRICARE For Life will always pay last. 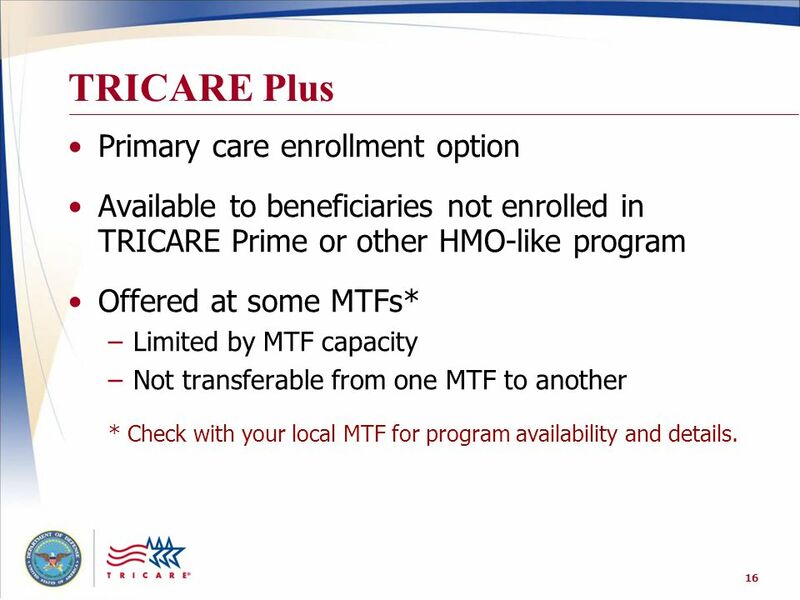 Available to beneficiaries not enrolled in TRICARE Prime or other HMO-like program Offered at some MTFs* Limited by MTF capacity Not transferable from one MTF to another * Check with your local MTF for program availability and details. TRICARE Plus is a primary care enrollment program that is offered at selected military treatment facilities. 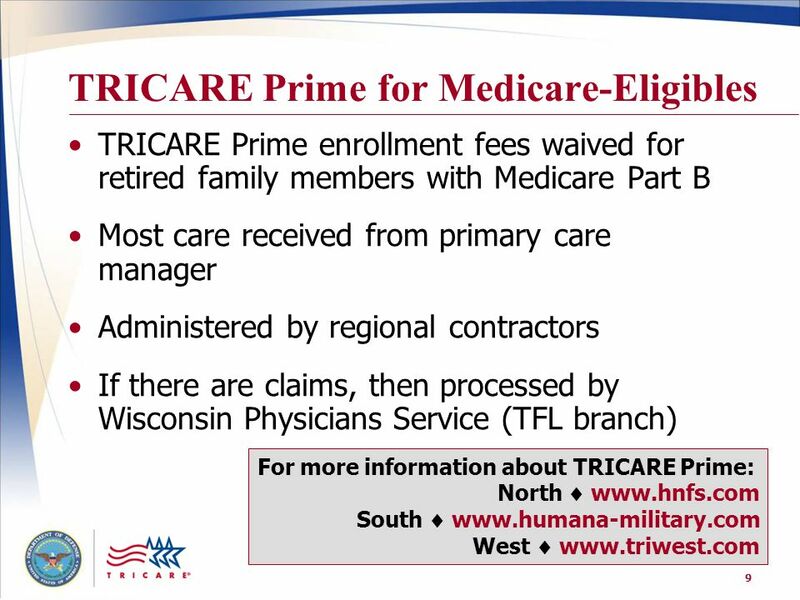 All beneficiaries eligible for MTF care (except those enrolled in TRICARE Prime, a civilian HMO, or Medicare HMO) can seek enrollment in TRICARE Plus if enrollment capacity exists. Note: TRICARE Plus is NOT transferable from MTF to MTF. 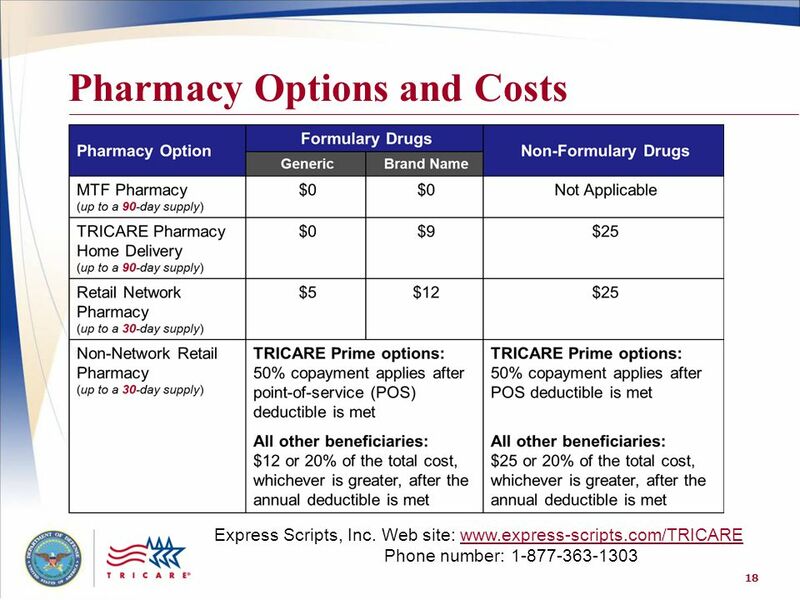 Unlike Prime, TRICARE Plus is not portable and availability can change if MTF capacity decreases. Non-enrollment in TRICARE Plus does not affect TRICARE For Life benefits or other existing programs. 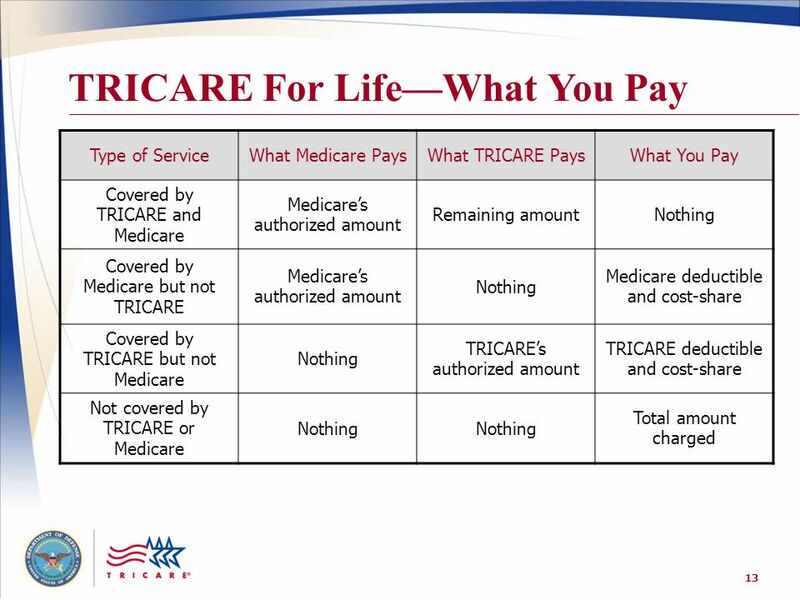 If you don’t have Part B and the care is not available in the MTF you will be responsible for all the charges because you will not be covered by TRICARE. 20 Visit www.usfhp.com for more information. 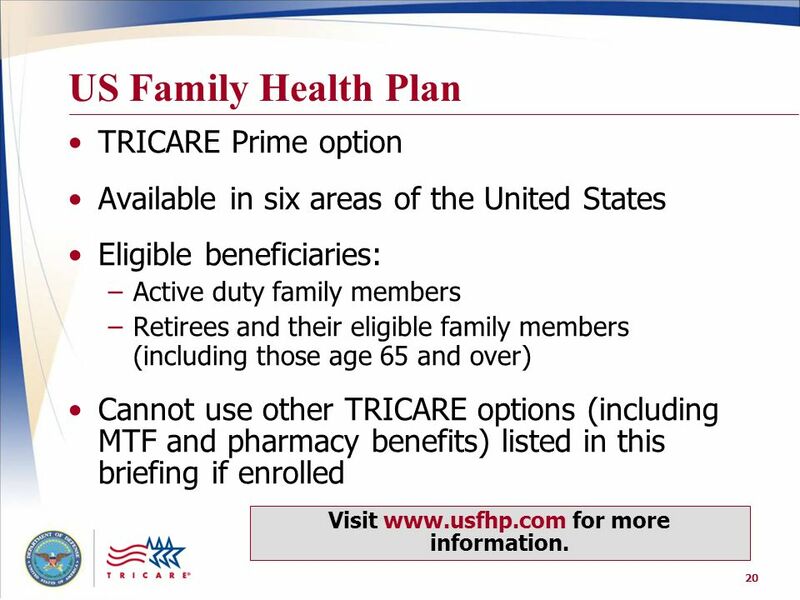 US Family Health Plan TRICARE Prime option Available in six areas of the United States Eligible beneficiaries: Active duty family members Retirees and their eligible family members (including those age 65 and over) Cannot use other TRICARE options (including MTF and pharmacy benefits) listed in this briefing if enrolled The Uniformed Services Family Health Plan (USFHP) is an additional TRICARE Prime option available to active duty family members and retired service members and their eligible family members, including those age 65 and over, through networks of community-based hospitals and physicians in six areas of the country. Note: Although Medicare-eligible beneficiaries are not required to have Medicare Part B coverage to enroll in the USFHP, we strongly recommend that you get Part B when you are first eligible to avoid surcharges if you decide to enroll at a later date (10% for each 12-month period after your initial enrollment period). 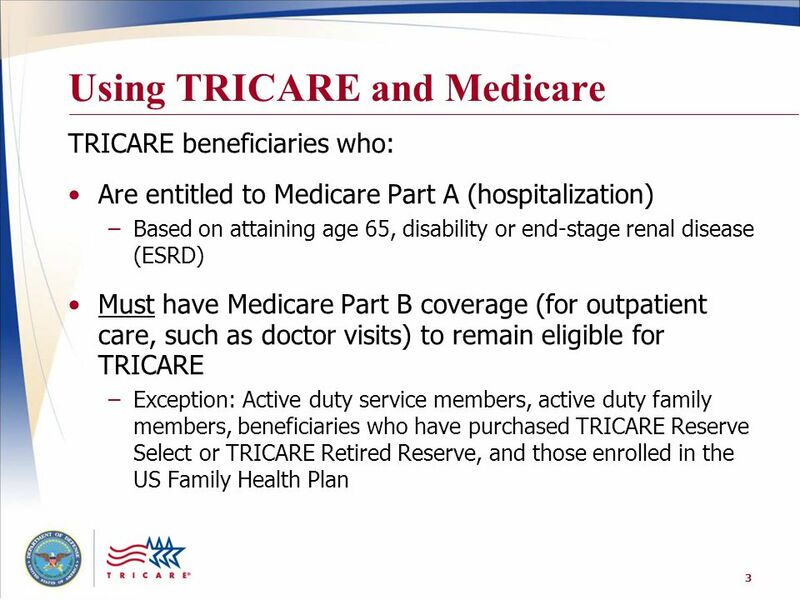 For instance, if you move from your USFHP location and its not offered in your new location, you will not be eligible for TRICARE without Medicare Part B. 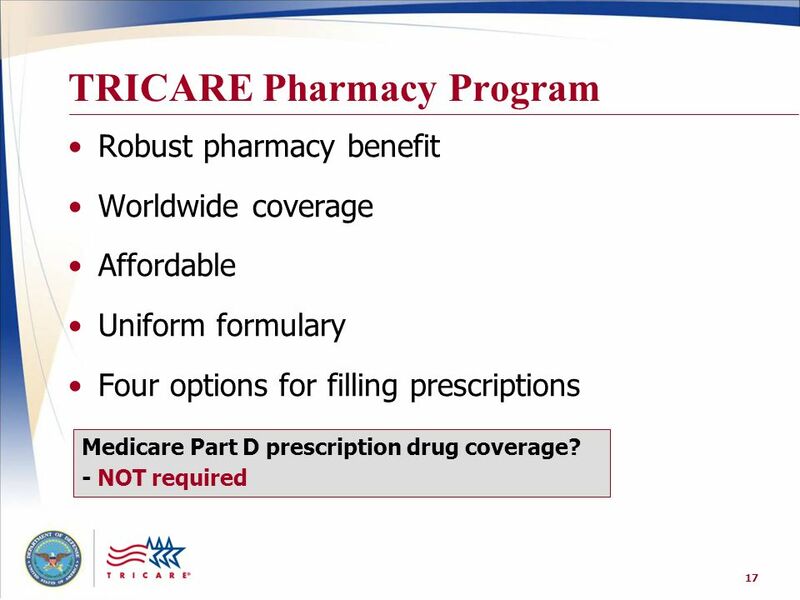 If you enroll in the USFHP, you are not eligible to use other TRICARE options/benefits including TRICARE pharmacy benefits discussed in today’s presentation. For additional information, visit Visit for more information. 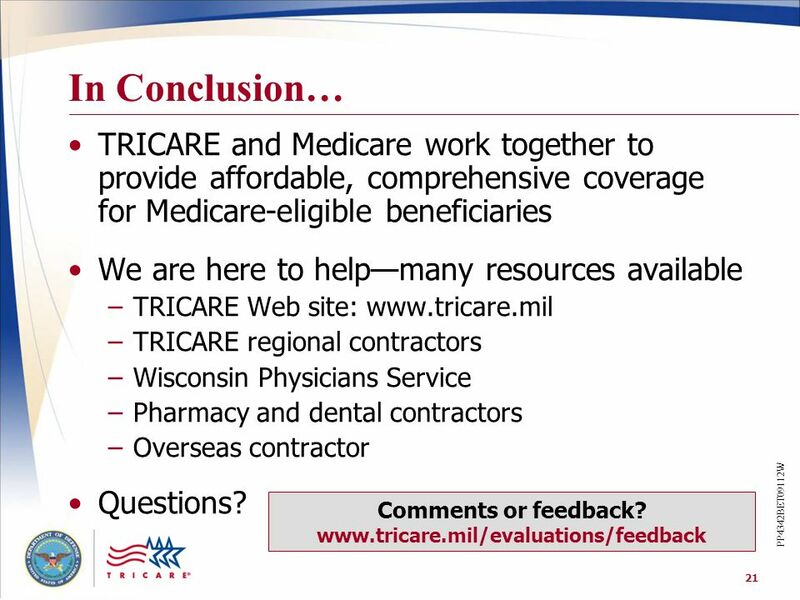 In Conclusion… TRICARE and Medicare work together to provide affordable, comprehensive coverage for Medicare-eligible beneficiaries We are here to help—many resources available TRICARE Web site: TRICARE regional contractors Wisconsin Physicians Service Pharmacy and dental contractors Overseas contractor Questions? PP4342BET09112W If you have any comments or additional feedback to this presentation or any other marketing and education materials, please visit Comments or feedback? 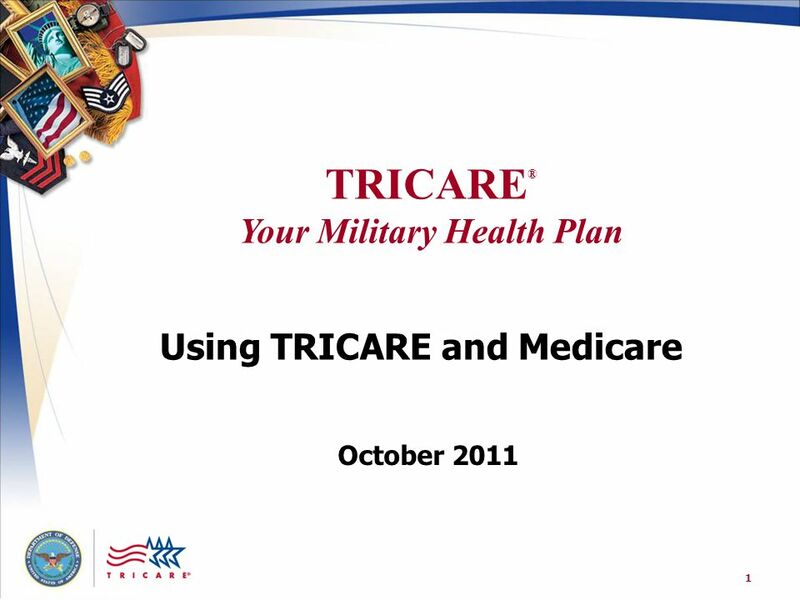 Download ppt "Using TRICARE and Medicare"
ARE BENEFITS THE SAME FOR ACTIVE DUTY AND RESERVISTS? A discussion on the differences between benefits Active, Reserve; Separated, Retired. Informed Decision Briefers: A1C Cirone SSgt Swift SSgt Swift. 1 Medicare and UC Medical Insurance. 2 Confused about Medicare and UC Medical Insurance? When does Medicare start? Do I lose my UC medical coverage? Do. Medicare Enrollment and Your UC Sponsored Medical Plan Coverage UCSF HR/Benefits Health Care Facilitator Program, 2009. DEERS/RAPIDS Retirement Brief Agenda Retiree ID Card Categories Dependent Children Former Spouse DEERS Updates Tricare Reserve Select Acceptable. 1 ISD 15 St Francis 2012 Retiree/COBRA Open Enrollment Meeting April 2012. Medicare Part D John A. Geib 10/3/05. Medicare Modernization Act (MMA) 2003 and How the MMA impacts California’s Medi-Cal Program Largest change in healthcare. Getting Started Version 12.  This training can help you make important Medicare decisions  Choosing health and prescription drug coverage  Timing your. 1 TRICARE Your Military Health Plan Overview of TRICARE Benefits for National Guard, Reserve Component Members and their families BR400801BEN0504C. 1.03 Healthcare Finances Understand healthcare agencies, finances, and trends Healthcare Finances Government Finances Private Finances 2.